Credit card issuers use one of several methods to calculate your finance charges — which is the fee you pay whenever you carry a balance on your credit card. All finance charges are based on your balance and interest rate. The methods differ in the way the credit card issuer calculates the balance before applying interest. 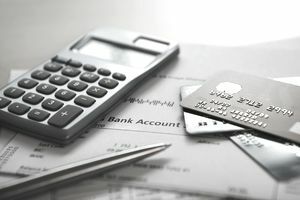 Knowing your card's finance charge calculation method can help you figure out how to minimize your finance charges, by paying earlier in the billing cycle in some cases. Your credit card issuer sets the finance charge calculation method as a company standard. You can find out which method your credit card issuer uses by reading your credit card agreement, reading the back of your credit card billing statement, or by calling your credit card issuer. The adjusted balance method of calculating your finance charge uses the previous balance from the end of your last billing cycle and subtracts any payments and credits made during the current billing cycle. New charges made during the billing cycle are not factored into the adjusted balance. The periodic rate, your interest rate broken down based on your billing cycle, is applied to the adjusted balance to calculate the finance charge. Here's an example of how your finance charge would be calculated if your credit card issuer uses the adjusted balance method. The adjusted balance method always gives you somewhat of a grace period on new purchases. Because purchases made in the billing cycle aren't factored into your balance, you won't pay interest on them if you pay them off before the last day of the billing cycle. Of all the methods of calculating finance charges, the adjusted balance method usually results in the lowest finance charge for consumers. Unfortunately, not many credit card issuers use this method. Most use either the daily balance or average daily balance method which takes into account all transactions made during the billing cycle and, and purchases made during the billing cycle in some cases. You can typically avoid paying interest by paying your credit card balance in full each month. Not only will you save money on finance charges, but you'll also eliminate the possibility of accumulating credit card debt. You may not be able to avoid paying interest on a cash advance balance, which may begin accumulating finance charges right away depending on your credit card terms. If you already have a balance on your credit card, you won't be able to avoid paying finance charges until you reach a zero balance. As you pay off your credit card balance, your finance charges will decrease each month until the balance is completely repaid.